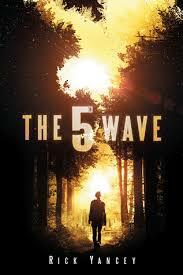 The 5th Wave movie is soon to be released, and this book has been out for a pretty long time now, so I thought I better read it to see what all the hype is about. I have to say that I think it’s overhyped, because although I enjoyed the story, there were certain perspectives that didn’t interest me at all. Suspense wise, though, this series is very promising and I look forward to the sequel. Ben – aka. Zombie, that’s what he’s known in the Camp, anyway. Ben was probably my favourite character because he’s strong, but he’s also managed to keep part of his humanity. He’s still got a sense of humour, and generally he’s just a nice guy, who tries to make life easier for the younger kids in his team, namely Nugget. I loved how compassionate he was, and how although he’s resigned himself to the fact that this is Earth and this is his life now, he’s not about to let that knowledge stop him from trying to change that. Evan – is super mysterious, and has a very intriguing backstory. I can’t say I particularly liked his character. He felt a bit like Adam from the Shatter Me series, the way he was obsessed with Cassie. Still, he’s another strong character, and I think his role on a larger scale will only become apartment later in the series. The 5th Wave is full of secondary characters, the most important ones being the other members of Ben’s team at the Camp. They were what made me love Ben’s sections. They each has distinct personalities – admittedly they could be skipped over – but Ringer was the stand out character for me. She’s not introduced until roughly half way through, maybe even later, but my goodness does she add something new to the team. I had a few Delirium vibes from her introduction, especially with the relationship she had with Ben, and I disappointed that her introduction was basically just a plot device so we could get out of the Camp setting and into the battle zone. Hopefully her potential is fully realised in the next book! Loved your review! I personally enjoyed this book a lot and completely agree with you that there shouldn’t have been a romance… and isn’t Cassie’s brother the most adorable thing ever??! !